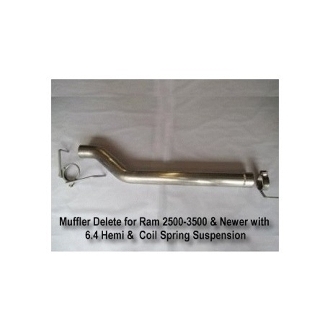 DOD250035MD – is a bolt in Muffler Delete for the factory’s Restrictive Muffler. Factory Muffler has a valve for full exhaust restriction at Part throttle. This kit is made of 3.5” Stainless Steel tubing. No welding required. VERY Aggressive sound level. This is for 2014 Dodge 2500’s with 6.4 Hemi engine and coil spring rear suspension.